Starting today, our latest major software update will become available to WiFi-connected Origins everywhere. This release, which we are calling Dolores, is designed in response to the growing abilities and ambitions of our user community and is our most impactful software release to date. 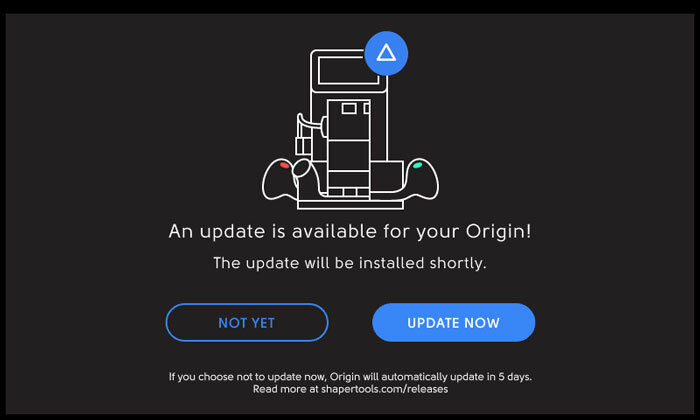 As our users take on larger and more complex projects, we want Origin to keep pace and continue to encourage you to tackle the next project. In addition to significant performance enhancements including SVG parsing and rendering capabilities, we’ve improved and refined a number of current features. We have increased the spindle retraction speed when cutting is finished, so that you can more quickly move between cuts, greatly decreasing cut time on more complex projects. This also helps to protect your workpiece and decrease the possibility of workpiece damage in the event of operator error. Pocketing procedure is now simplified, as well. You can now begin pocketing anywhere within the pocket and proceed in whatever way is most intuitive and appropriate to a given pocket. We have added a Path Selector Button to eliminate any confusion when cutting in an area intersected by multiple cut paths. 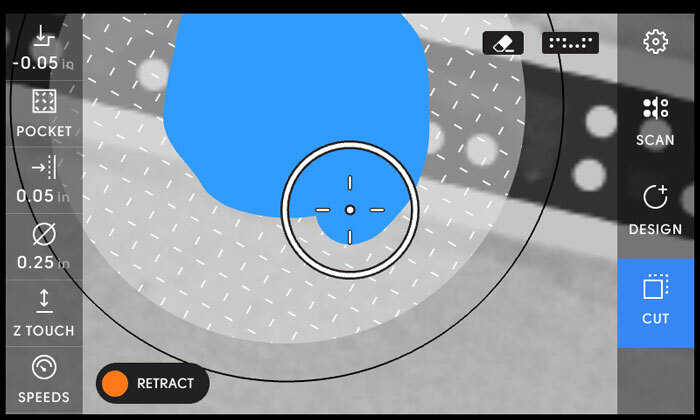 The button will automatically appear whenever multiple paths pass through the cutting reticule. Tapping Select will allow you to toggle through the available cuttable paths. Holding down the Select button will highlight all available cut paths within your cutting reticule. 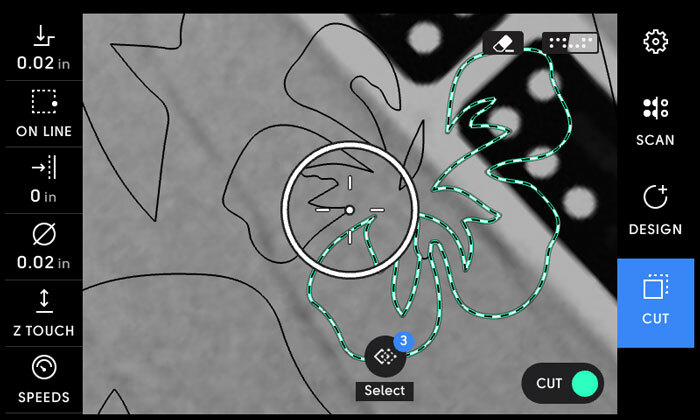 Nearby paths show the area that will be cut with your inputted cutter diameter so that you can identify any overlapping cut areas. Finally, a selected cut path now shows on-screen as a thicker, better contrasting green line, removing any ambiguity about what you’re about to cut. 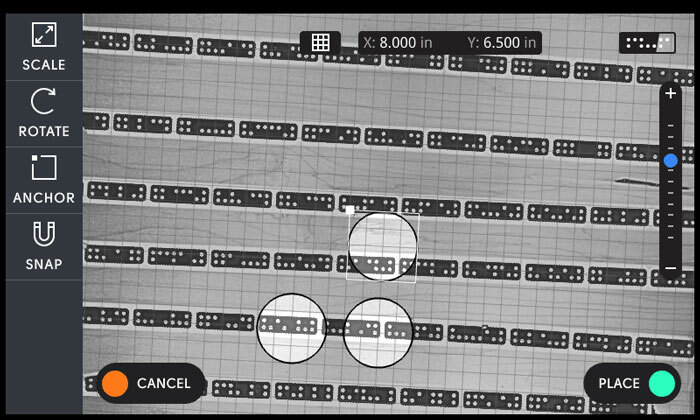 Many users have expressed a desire to zoom in to more precisely place their designs in reference to a feature of the workpiece surface or to a particular location on a workpiece grid. 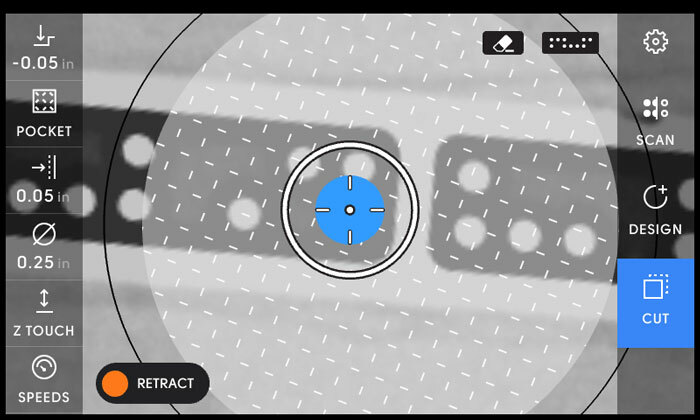 There is now a zoom function available while placing a design on a workpiece, giving users a wider variety of visual context to consider when deciding on placement. Origin now saves the anchor point that a user selects when placing a shape, and automatically defaults to that anchor point when that shape is copied. These sticky anchor points make it simpler and faster to create reiterated designs using Origin’s on-tool CAD. Users love that Origin’s performance and capabilities improve with each software update. We’ve now taken steps to significantly improve that software update experience . To reduce ambiguity, users are shown clear indications of the progress of updates. Although any tool connected to Wi-Fi is able to download the latest software version, you will now be able to choose to postpone the installation of software updates if, for example, you’re in the middle of a big job that you want to complete without disruption. You can delay software installation for up to five days, allowing you to upgrade your tool on a schedule convenient to your workflow. Dolores continues our objective of massively increasing the performance and usability of Origin. We’ve highlighted some of the major updates here, but there are too many improvements to include here. For a more comprehensive list of all the enhancements included in Dolores, see our release notes. As always, we want to thank all our users for their input and feature requests. Once you have updated your tool to the latest software, come join the conversation and let us know what you think, and what you plan to build next.